I just love the new stamps from the "you are so special" line. I couldn't wait to ink them up and have some fun with them. This is a card that I've done for a friends birthday coming up next month. The colors I'll admit are alot brighter than I'm used to. Trying to break out of my comfort zone...not sure how that's working for me yet. Thanks so much for stopping by. I hope you're all enjoying the beautiful weather outstide. Wow, this is a very special card indeed! Such beautiful details and I love how you put the two Tildas together! A totally awesome card! Very beautiful card, I bet your friend will cherish it! Gorgeous colors. Gorgeous card. Love these two together. Love the embossed background. Oh this is adorable!!! !Love it!!!! Super cute!!! I think your friend will absolutely adore this card. Tilda is coloured beautifully and I love the layout. 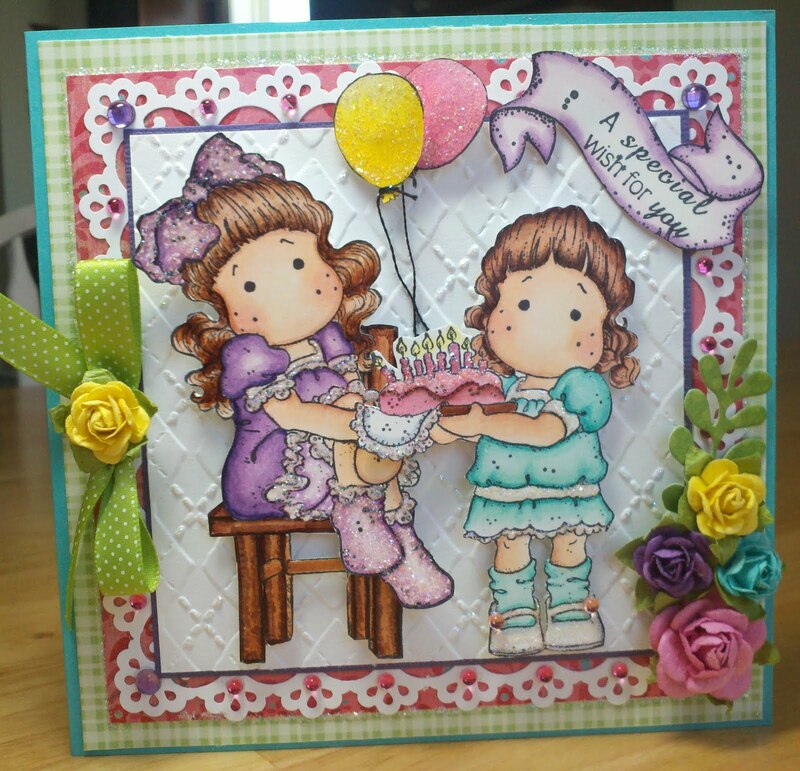 Your card is gorgeous and I love the colors with your beautiful coloring of the Tilda's everything is perfect. Oh my gosh, I LOVE this!!! Beautiful colors, gorgeous coloring, and fantastic layout and design! A truly fabulous Birthday card!! Holey moley! Your card is gorgeous! You've included so many wonderful elements! I just kept looking at it and the more I looked, the more I found! What a wonderful job! Oh my gosh this is FANTASTIC! How wonderful!!! I love it! Lovely card and I think your colour pallette works really well. What an adorable card! LOVE how you put the two together! Just a wonderful layout and beautiful coloring!!! Lucky friend! with the two Tilda's...love your color choices and coloring. I will tell you one thing - you were born to scrap!! This card is delightful - from the wonderful colors to the fabulous scene - I could not brag on this card enough - I love it and all the embellishments you have orchestrated. Oh how beautiful this card is! The two images are so perfect together and that's a great scene you created! Love all the cheerful, bright colors...perfect for a celebration! This is such a beautiful card! I'd be ecstatic if someone sent me a birthday wish like this!! I love the colors you've chosen ~ they're just so cheery!! What an absolute delightful card featuring two adorable Tildas! Great details! adorable! lovely coloring and creating! Great card! Love these 2 stamps put together! Great idea! Thanks for sharing! What a darling card. Love the colors you chose. Julie this is so beautiful hun! I love how you have used all these fabulous Tildas together! STUNNING work hun! Thanks for joining us at WOC! Absolutely adorable!! I love how you used both of the stamps together. Great coloring! !